How can I contact you with technical questions? We prefer to answer technical questions by email. How should I prepare my DNA construct and how much DNA should I send? Once you have determined that the construct was correctly engineered (by sequencing or restriction digestion), you should do the standard plasmid prep. The DNA should be BEADS-FREE!! We require Qiagen-column (midi/maxi) quality DNA with more than 500 ng/µl and at least 50 µg per sample for P-element injection, or at least 20 µg per sample for PhiC31 injection. For CRISPR injections, if you are sending the premixed DNA samples, please send at least 30 µl (better > 50 µl) of DNA not exceeding 1.0 µg/µl. We prefer DNA in ultrapure water so we can inject it directly. Alternatively, the DNA can be dissolved in TE or the Qiagen EB. In any case, please make a very clear "Remark" on the order form to ensure us to prepare the DNA properly for injection. If you are sending samples for the DNA preparation service (Service Z), please send about 3-5 µg for the bacteria transformation and the quality control (restriction) test. If you prefer to send bacteria please send it as liquid culture in screw-capped tubes for better shipping protection. Stab agar is ok and better than sending plates. Please always include a simple plasmid map or restriction information for the quality control (restriction) test. Can I use my own helper plasmid? Yes. Generally we provide the helper plasmid that will be injected with your P-element construct. However, if you prefer your own 2-3 plasmid. Please send us at least 20 µg column-purified plasmid with its concentration labeled (at least 500 ng/µl). Can I use my own flies for injection? Yes! Other than w1118 and yw we can inject to any Drosophila strain for a small initial fee ($100). For details please refer to the service page. Will you perform the injection or keep the flies at 18 °C? Yes. We will do this ONLY IF you request to do it. In addition, if you think your gene of interest may cause lethality, or your construct is driven by heat shock promoter or similar kind, it may be better to keep the flies at 18 °C for the whole process, please let us know in advance! Longer turnover time will be expected for such kind of special request. How long to get my transformants? We will do the injection as soon as we get your DNA sample. The minimum turnover time, from reception of the DNA to delivery of the larvae, is within 10 days. It can be longer depending on the service plan, please see the service page. We will ship the larvae or transformants to you via FedEx, UPS or USPS. Can I use my own balancer chromosome rather than FM7, CyO, TM3, TM6B? How long will you keep the flies? For Plan B/C/E/F/H/I/J/K/M/N only. We will destroy G2 or balanced lines in two weeks after you receive your shipment. Please let us know any problem within two weeks so that we’re able to send the backup flies in need. Which FlyC31 line has better expression efficiency? You can refer to Bellen's paper and Basler's webpage for the list of eye colors. However, we do believe the eye color is not a good indicator for relative expression level due to the nature of the white gene. We are currently transforming all lines using our reporter gene and as soon as we have the result we will post it on the site. Which FlyC31 line has better transformation efficiency? Please refer to Bellen's paper and Basler's webpage. We are collecting the data and will post it on the site whenever possible. Is there any special DNA quality requirement for PhiC31 system? We suggest the same DNA treatment as that of the P-element system. CsCl quality DNA was reported to have better transformation efficiency (about 2x). However, please stick to the Qiagen midi/maxi DNA if you are not expert at doing the CsCl-prep. Where can I get the FlyC31/P[acman] vectors? We can not provide vectors due to MTA. Please refer to the webpage for the contact information of the Basler lab. Please write to them directly for the pUASTattB and pattB vectors. You can get Bellen's vectors at DGRC directly. How can I contact you with ordering questions? Can I cancel my order or change the service plan? Yes. Please email us as soon as possible. We will try our best to arrange the changes, e.g. when we get your email at early stage of the order it will be free of charge. If somehow it's too late to make the change we will only charge you an appropriate amount to cover our cost, e.g. when we'd already mailed out your "Plan B - Standard service" but you wish to upgrade to "Plan C - Premium Service", we will charge you US$25 more for the extra "handling fee" and the $100 for the difference of plan B and plan C.
Can I track the status of my sample? Yes. From our user-friendly database, you can track your sample online. It shows information of sample arrival, injection time, balancing cross and more. Can I have a special order? If you have special requirement or decide to upgrade your service plan, you may also email us. Do you ship with courier? Yes! Flies will be sent back with courier. We prefer to use FedEx. UPS or USPS is ok but not recommended. Additional shipping charges for customers not providing their courier number. Please provide us your courier account number (FedEx or UPS). Otherwise, you will expect an extra US$50 of shipping charge (US$100 for international customers, including Canada) per shipment. Dead on Arrival (DOA) shipments. We are very sure all flies (usually as larvae) are in good condition when we send them out. We also request the latest pickup and early morning delivery to avoid any potential shipping damage to the flies. However if DOA do happen, please report to us immediately and we will prepare the shipment again, free of charge. Customers are responsible for the reshipping charge. We will keep the backup flies for at least two weeks and maybe up to four weeks. Is there any precaution if I am sending the DNA samples overseas? USDA does not require an import permit for bacteria-produced plasmid sample. But the following statement must be included with the sample. - A detailed and accurate description of the material including genetic insert. 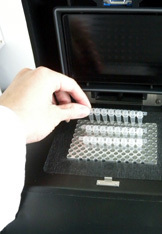 - A declaration, if applicable, indicating that the material is produced by microbial fermentation. - A declaration stating the material does not contain any animal or cell culture derived products or additives such as albumin or serum. - Mention the following at the above docs - "Harmonized Tariff Number: 2934999000; Description of goods: Plasmid DNA Sample - Non-hazardous, non-infectious for research purposes only. No commercial value." - A $1-commercial-invoice as the value of the plasmid DNA in the FedEx pouch (outside of the FedEx box). - If you are not sure, please email us for a template. How should I ship the DNA samples? Should I use dry ice? Please parafilm and protect the tubes carefully. Wet/Dry ice shipment is NOT necessary! Where should I ship the DNA samples? Is there anything I should not ship? Please refer to the Select Agent Program web page from the Centers for Disease Control and Prevention. How should I ship new flies for custom-injection orders? Please send several PLASTIC VIALS (e.g. 3-4 vials) of flies preferably as different stages including one fresh vial flipped right before the shipment. Please do NOT send bottles or glass vials! Please email us for details, especially if you need an USDA import permit for sending flies from overseas. When will the new fly be ready for injection? Usually 4-6 weeks the fly number is enough but they usually take one more generation (i.e. 6-8 weeks) to adapt to the cage and lay good eggs. Can I check my current and past invoices online? Yes. From our user-friendly database, you can check all of your orders online. It shows information of orders, credits, payments and all details. How can I contact you with billing questions? Currently discounts are only available for immediate payments and pre-payments. See here. You can include your credit card information in the online or offline order form, or give us a call. Returned check charge? Or rebill fee? US$30 will be charged for extra bank/courier administration fee if we got returned check, less wire amount or invalid courier account related to your payment/shipment. Please acknowledge BestGene Inc in the resultant publication and forward us a copy.